Talk about excitement! With Bruce Springsteen And The E Street Band just minutes from taking the halftime stage at Super Bowl XLIII, the Pittsburgh Steelers' James Harrison intercepted the ball and made a 100-yard run - the longest play in Super Bowl history - giving the Steelers a 17-7 lead. If ever the Boss had his work cut out for him, it was tonight. But no matter - from the moment he and the E Streeters stormed the stage, the stadium was all theirs. "Ladies and gentlemen for the next 12 minutes we're going to bring the righteous and mighty power of the E Street Band into your beautiful home!" Springsteen yelled. "I want you to step back from the guacamole dip. I want you to put those chicken fingers down and turn your television all the way up!" Leaping on top of Roy Bittan's piano, Bruce shouted "Is anybody alive out there?!" - which got a thunderous response - and gave the signal for the band to take off, roaring into a muscular, abridged version of Tenth Avenue Freeze-Out. The audience flooded the field and pressed against the barriers as Bruce laughed and said, "This is the most important part!" - his way of introducing Clarence Clemons - the Big Man - who shot out a spirited sax solo. Already giddy, Springsteen capped the song with a stage-long knee slide right into a camera as the band shifted into a full-throttle Born To Run - a brilliant choice, topped off by a massive fireworks display. Finishing the number, Springsteen channeled Pete Townshend with some brisk windmills. Then a gospel choir - which MusicRadar now declares an overused cliche that must be stopped immediately - joined the ever-growing E Street Band for Working On A Dream, the title track to The Boss's new album and his main reason for showing up in the first place. But their presence was short-lived, as Bruce cut the number midway and tore into a stomping, sports-friendly Glory Days. What is perhaps Springsteen's most generic number worked like magic before the 70,000+ crowd. At the song's end, now thoroughly energized and ready for his mandatory three hours of rocking, Springsteen nonetheless had to deliver the sad news: "Steve, I think it's time to go!" he said, looking towards guitarist Steven Van Zandt. "So what!" said Van Zandt, brushing off Bruce's suggestion to exit. "It's penalty time!" 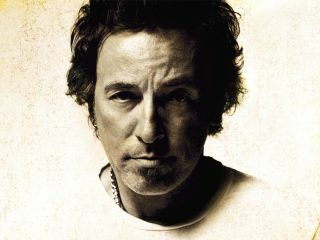 said Bruce, to which Van Zandt cried, "It's Boss Time!" The audience went ape. With fireworks exploding behind him, Springsteen, whipping his guitar around his neck like a 20-year-old, announced, "I'm going to Disneyland!" For a second, he forgot he was in Florida - home to Disney World. But when you've just packed 30 years of rock 'n' roll history into 12 incredible minutes, you don't sweat the small stuff.